Washington, DC. Fujisankei Communications International, with support from Nitto Tire U.S.A., Inc, both Japanese firms, recently produced Journey to Washington, a 60 minute documentary on the life of the late US Senator Daniel K. Inouye. Gerald Yamada, President of the Japanese American Veterans Association, has written the following review. “Journey to Washington” is a DVD that gives a comprehensive portrayal of the life of the late US Senator Daniel K. Inouye. The DVD details the Senator’s life from US citizen through various stages of his life — enemy alien, military hero, Japanese American pioneer in Hawaii politics, major national politician, and highest ranking Asian American in the United States. At the time of his death, Senator Inouye was President Pro Tempore of the United States Senate, making him third in line to succeed the President of the United States. In the DVD, Dan Inouye, at the outbreak of World War II, felt that he was as good as any other American. He loved America and was fiercely loyal to the United States. He was deeply hurt when he was classified as an enemy alien and was one of the first to volunteer from Hawaii to serve in the 442nRegimental Combat Team when the opportunity became available. Like the 4,000 young Nisei who volunteered from Hawaii and the mainland, many from internment camps, Inouye volunteered for combat duty to prove his loyalty. His military career brought out his leadership qualities that served him well later in his political career. His combat experience enriched his personal values of duty, honor, and homeland. The “Journey to Washington” memorializes Senator Inouye’s long and glorious journey. He truly was a trail blazer. He was a powerful voice for the State of Hawaii, for Japanese Americans, and for veterans. He lifted barriers for others. And, he will be missed as a great American statesman. 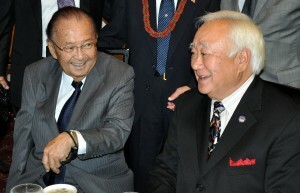 The DVD filmed the Senator Inouye over 1½ years before he passed away. The DVD does an excellent job in showing how Dan Inouye’s pride in his Japanese heritage, love of country, and military service molded his personal values and carried him to the pinnacle of his career. The value of the DVD is that it preserves Senator Inouye’s legacy. He is a role model for others and future generations who can listen to his reassuring advice “If I can make it, you can.” Any person wishing to receive a copy of Journey to Washington, please contact Terry Shima, JAVA, ttshima@comcast.net or 415 Russell Ave, #1005, Gaithersburg, MD 20877.